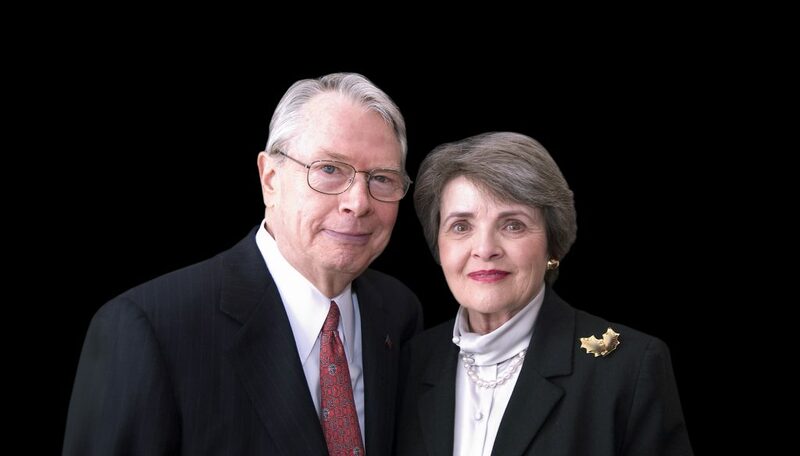 Harold and Joanne Hook are passionate about education, and their gifts have been used to establish the Hook Center for Educational Renewal and to endow the Joanne H. Hook Dean’s Chair in Educational Renewal. To learn more about the Hooks and their remarkable careers please see the story below that appeared in the college’s Spring 2014 Ed Life magazine. It takes just a quick look at Harold Hook’s list of achievements to know he is a natural born leader. The youngest of four boys, Hook grew up on a dairy farm in Lee’s Summit, Mo. He followed his three older brothers to the University of Missouri, earning a bachelor’s degree in business administration in 1953 and a master’s degree in accounting one year later. In the music room of the Memorial Student Union before his speech last night, former President Harry S. Truman goes over some last minute details for the dinner with three presidents of the Student Union Activities Board. They are, left to right, Harold Hook, 1952-53; Edwin Werner, 1953-54; and John Collet, 1954-55. Photo and caption courtesy of the Columbia Missourian, April 14, 1954. While at MU, Hook was an active member of the Missouri Students Association, Beta Theta Pi, Alpha Pi Zeta, Beta Gamma Sigma, The Mystical Seven and Omicron Delta Kappa—in addition to serving as president of the Student Union Activities Board (a precursor to the Missouri Student Association). “My time at Mizzou was life changing,” says Hook. 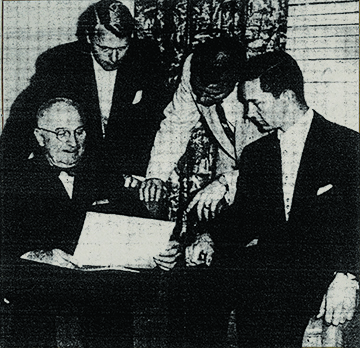 Hook, a Jackson County resident, was in graduate school at MU when then-President Frederick Middlebush tapped him to introduce former president Harry S. Truman when Truman visited the MU campus in 1954. After graduating from MU, Hook served from 1954 to 1957 as an executive officer and navigator on a minesweeper in the U.S. Navy. In 1965, Hook made history as the youngest insurance company president in the nation when he became president of the National Fidelity Life Insurance Company at age 31. In total, he spent 40 years in the life insurance and financial services industries before retiring in 1997, which included 18 years as chairman and CEO of American General Corporation. American General is one of the nation’s largest insurance and financial services organizations. As the company’s third president, Hook embarked on a new growth initiative that brought 20 new firms into the company which nearly tripled its size. He also launched Main Event Management Corporation in 1971, which provides management training and organization development services to help effectively manage organizations, large and small. His legendary business acumen earned him numerous awards and recognition, including Texas Business Executive of the Year by Texas A&M University, Houston Businessman of the Year by the Stanford Business School Alumni Association and induction into the Texas Business Hall of Fame. “As a CEO, Harold had excellent judgment and courage,” says Bill Phelps, a former student of Harold’s, business associate and personal friend. Phelps also served as lieutenant governor of Missouri from 1972 to 1980. Joanne Hunt represented Pi Beta Phi her sophomore year and reigned over the Military Ball in 1953. Photo courtesy University Archives/1953 Savitar. While at Mizzou, it only took one glance for Hook to become smitten with Joanne Hunt. Joanne Hook taught in the Panama City School System and at Tyndall Air Force Base in Florida while Hook was in the Navy. They welcomed their first child, Karen, while stationed in Charleston, S. C., and then moved to Kansas City, Mo., where their two sons, Tom and Randy, were born. The Hooks, who also have five grandchildren, now reside in Houston, Texas. Hook is widely known for his outstanding business career, as well as serving in leadership positions for more than 20 civic and philanthropic organizations. A recipient of the Distinguished Eagle Scout Award, he went on to become national president of the Boy Scouts of America, as well as president of the Houston Chamber of Commerce. Hook has also been a loyal supporter of MU. He was a member of the Trulaske College of Business Strategic Development Board, For All We Call Mizzou National Campaign Steering Committee and numerous other MU committees and groups. 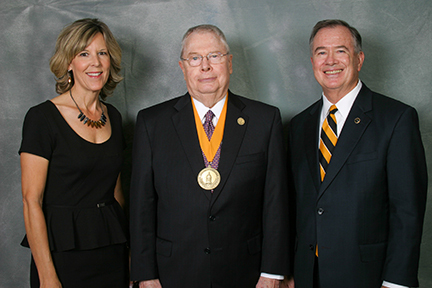 In recognition and appreciation for his service to the university, he received the Distinguished Service Award from the Mizzou Alumni Association (MAA) in 2013, one of MAA’s highest honors. He also received a Citation of Merit from the Trulaske College of Business in 1965, Mizzou Alumni Award in 1978, Honorary Doctorate of Law in 1983 and Friend of the College Award from the College of Education in 2009. Joanne is active in the Daughters of the American Revolution, Phi Beta Phi Alumnae Board and several volunteer organizations. Jim Hook says in college he got most of the ink as a quarterback on the MU football team, but it wasn’t long before the tables turned and Harold Hook began receiving a good deal of attention in the media for his business accomplishments. “All of us older brothers turned to Harold for advice and counsel on business matters,” says Jim Hook. 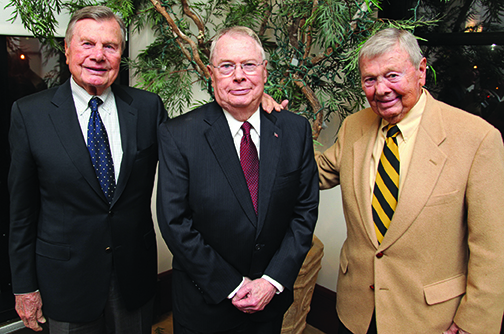 In October 2013, Harold Hook (center) received the Distinguished Service Award from the Mizzou Alumni Association, one of the association’s highest honors. Two of his three older brothers were able to attend the ceremony—Oliver (left) and Jim (right). All four brothers attended the University of Missouri. In 2004, the Hooks established the Hook Center for Educational Leadership and District Renewal and the Joanne H. Hook Dean’s Chair in Educational Renewal. “It is the college’s largest single gift,” says Clay. Focus areas include improving the education system for individual schools, districts and colleges; improving public policies related to innovative and effective school governance; and developing talented principals, superintendents, board members and other educational leaders. A special focus area of the center is turning around low-performing schools into national models of educational excellence. The Hook Center also recently launched the Missouri Network for Educational Improvement (MNEI). MNEI is an ambitious statewide partnership between the Missouri School Board Association, Missouri Association of School Administrators, teacher associations in Missouri and business leaders. The network develops systematic approaches to improving how schools are managed. The Hook Center also recently hosted a Performance Excellence Symposium for school leaders that highlighted innovative educational practices and provided districts with training on the Model-Netics® management system developed by Harold Hook. Other initiatives are in the planning stages that will bring together school leaders and policymakers around the educational renewal of Missouri schools.